For those determined to own a new home in an idyllic Caribbean luxury location, Barbados property for sale has everything they could imagine. Known as the gem of the Caribbean, Barbados real estate is one of the most popular luxury holiday home destinations in the world. As one of the most successful international real estate markets globally, Barbados is synonymous with the best of Caribbean living, offering an air of luxury and relaxation that cannot be rivalled anywhere else in the region. Fashionable and relatively unspoilt, with boundless character, Barbados is a naturally stunning Caribbean island that has attracted a host of celebrities, along with wealthy international property buyers looking for luxury retirement and vacation homes. Buyers of Barbados property are mainly British, American and Canadian, with some Russians and East Europeans. The properties are amazing, the people are wonderful and the economy is stable. Add to that the fact that there are plenty of internationally recognised restaurants, first-class golf courses, fabulous spas and quaint beach bars, plus superb white sandy beaches and the incredibly clear waters of the Caribbean. Here, one will find the ultimate opportunity to relax and escape the rest of the world. The property market in Barbados is known for its stability, both economically and politically – the island boasts the third oldest parliamentary system in the Western Hemisphere. The year-round temperate climate and lush, exotic landscape make Barbados the idyll of many a sports aficionado. The island is known for providing excellent facilities and a wide range of activities. Possibly the most glamorous of them all, the Barbados polo scene is a vibrant mix of horsemanship, sophistication, tradition and glitz. Polo is an intrinsic part of the island’s heritage and the island offers some of the best venues in the world, the most famous of which is Kensington Oval. Established in 1871, Kensington is known for its historic matches and sterling atmosphere. More than a dozen trophy games take place each season, providing a fascinating showcase of sport prowess by the most talented players on the country’s polo circuit, plus exciting international games against top-rated teams from the U.S., Jamaica, Canada, the UK, Italy, Argentina and Venezuela. In cricket, Barbados has produced some of the greatest legends in the world, including Charlie Griffith, Gordon Greenidge, Desmond Haynes, Seymour Nurse, Malcolm Marshall, Wes Hall, Sir Clyde Walcott, Sir Everton Weekes, Sir Frank Worrell and Sir Garfield Sobers. Barbados is also a golfers’ paradise and has several world-class golf courses such as Royal Westmoreland, Sandy Lane and Apes Hill. It is a leading mega-yacht location and there are two major luxury marina resorts on the West Coast of the island. Port St. Charles and Port Ferdinand offer yacht owners the best amenities in the Caribbean and frequent guests include the likes of Sir Richard Branson (Virgin), Paul Allen (co-founder of Microsoft), Roman Abramovich (Russian oligarch) and members of the British and Qatari royal families. But underneath Barbados’ Old World allure lies a high standard of living combined with a modern infrastructure that includes fantastic healthcare with two major hospitals, a well-established banking system, top-rated educational system, outstanding telecommunications and a well-developed legal system that’s derived from the English common law. While Barbados is not a tax haven, there are no capital gains, gift or inheritance taxes and the island does have Double Taxation Agreements with 34 countries, including Canada, the United States and the United Kingdom. Consequently, individuals who are residents but not domiciled in Barbados are only taxed on their income derived from Barbados activities. Barbados offers easy access as many international airlines provide non-stop flights from a number of gateway cities in the UK, U.S. and Canada, plus daily flights from other Caribbean islands. With modern travel amenities, approximately 16 major carriers and charters operate from Grantley Adams International Airport. For many, owning a home in Barbados is a personal lifestyle choice, and many property buyers are looking for a second home or a rental or retirement investment. Barbados has a host of luxury properties for sale in locations that will make it the ideal luxury retreat. There is a wonderful selection of super luxury beachfront houses and condominiums. Buying in developments or a community remains popular, especially for those buying a second home who want to lock up and leave when not in residence. They see established developments with community activities, such Royal Westmoreland, as very desirable. Barbados’ colonial history has also left it with some spectacular plantation houses. These large estates, once occupied by the island’s most powerful land-owning families, are being refurbished, and with no restrictions on foreign ownership, some of the island’s most fascinating properties, which usually sit on significant properties, are wide open for purchase. All that is required for non-residents wanting to acquire Barbados real estate is to have the necessary funds from external sources that are registered with the Central Bank of Barbados. Steeped in culture, history and charm, Barbados is one of the world’s best-loved island destinations, not only for its incredible beaches but also because of its vibrant culture, incredible dining scene and fabulous calendar of events. Barbados property continues to grow in popularity amongst international real estate buyers. It is not hard so see why they choose the island for their second home. 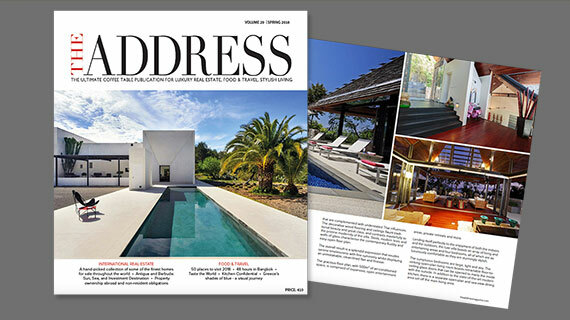 Read more about Barbados real estate for sale in THE ADDRESS Magazine.